Gemmae Bake Shop — Gemmae Bake Shop serves authentic Filipino breads, cakes, pastries, desserts and prepared food. Baked hand-held pie with flaky crust and chicken filling. Crispy meringue cake layered with rich buttercream, topped with chopped cashews. Savory pork egg rolls, deep-fried to a delicious crunch. 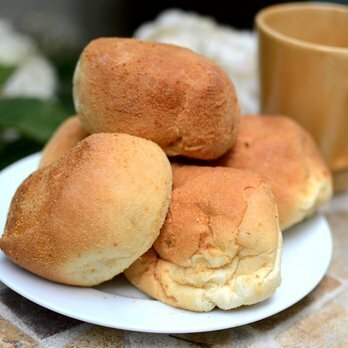 Bread roll with creamy, sweet cheese filling, topped with a sprinkle of sugar. Soft bread roll with sweet coconut filling. Soft bread roll with rich ube (sweet purple yam) filling. Bread roll filled with cheddar cheese blend. Soft bread buns, topped with butter. Filipino-style sliced bread, slightly sweeter. Bread loaf with sweetened red bean paste braided throughout bread. Bread loaf with our own Ube Halaya braided throughout bread. Bread loaf with ube swirl in the center. Baked bun with Adobo filling. Flaky buns with diced pork filling. Vanilla-Mango cake with rich mango buttercream frosting. Crunchy meringue cake layered with rich buttercream, topped with chopped cashews. Traditional Filipino cake made with grated cassava and coconut milk. Traditional Filipino cake made with rice, coconut milk, and salted egg, baked in banana leaf. Soft meringue roll with sweet custard filling. Filipino-style fruit cake. Vanilla cake topped with creamy custard and fruit cocktail. Saba banana and jackfruit wrapped in egg roll wrapper, deep-fried. Traditional Filipino dessert made with purple yam root and coconut milk. Sweet and creamy custard with smooth caramel topping. Sweet bar made with dried fruit and nuts. Sweet bite-sized macaroons made with coconut shreds. Dessert drink made with sweetened beans, coconut, ube halaya and leche flan, topped with shaved ice and evaporated milk. Dessert drink made with tapioca balls and gulaman (gelatin cubes), topped with shaved ice and brown sugar syrup. Dessert drink made with creamed corn and sugar, topped with shaved ice and evaporated milk. Fresh cantaloupe juice with grated cantaloupe flesh. Served seasonally.